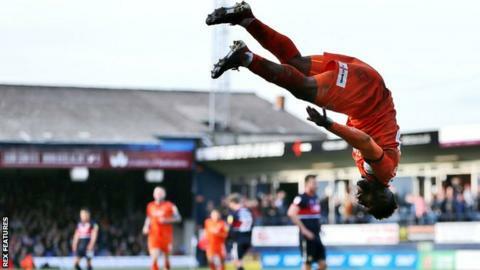 League One leaders Luton made it 26 games unbeaten with a thumping home victory over play-off hopefuls Doncaster. John Marquis shot straight at James Shea for the visitors early on, before Town took over, with Kazenga LuaLua's low blast parried by goalkeeper Marko Marosi and Elliot Lee blazing over. The Hatters took the lead in the 33rd minute, as LuaLua back-heeled for Pelly Ruddock to side-foot into the bottom corner from 20 yards. There was no stopping Hylton in the 57th minute, though, as he turned Luke Berry's shot over the line from close range after superb play by Jack Stacey. With eight minutes left, LuaLua got a hugely deserved third as he raced onto Stacey's pass to beat Marosi. Substitute Harry Cornick almost made it 4-0 but Berry did so in stoppage time, rifling home from 20 yards to crown a sumptuous display by Mick Harford's table-toppers. Only Manchester City (53) have scored more goals at home in league play this season than Luton Town (50). Match ends, Luton Town 4, Doncaster Rovers 0. Second Half ends, Luton Town 4, Doncaster Rovers 0. Goal! Luton Town 4, Doncaster Rovers 0. Luke Berry (Luton Town) right footed shot from outside the box to the top left corner. Corner, Doncaster Rovers. Conceded by Matty Pearson. Substitution, Luton Town. Jason Cummings replaces Kazenga LuaLua. Attempt saved. Harry Cornick (Luton Town) right footed shot from the left side of the box is saved in the centre of the goal. Delay in match Sonny Bradley (Luton Town) because of an injury. Goal! Luton Town 3, Doncaster Rovers 0. Kazenga LuaLua (Luton Town) left footed shot from the centre of the box to the bottom left corner. Assisted by Jack Stacey. Corner, Doncaster Rovers. Conceded by Elliot Lee. Foul by Harry Cornick (Luton Town). Danny Andrew (Doncaster Rovers) wins a free kick in the defensive half. Attempt saved. Pelly-Ruddock Mpanzu (Luton Town) right footed shot from outside the box is saved in the centre of the goal. Substitution, Luton Town. Harry Cornick replaces Danny Hylton because of an injury. Delay in match Danny Hylton (Luton Town) because of an injury. James Coppinger (Doncaster Rovers) is shown the yellow card. Attempt blocked. Kazenga LuaLua (Luton Town) right footed shot from the left side of the box is blocked. Corner, Luton Town. Conceded by Marko Marosi. Attempt saved. Danny Hylton (Luton Town) right footed shot from the centre of the box is saved in the centre of the goal. Corner, Doncaster Rovers. Conceded by Sonny Bradley. Attempt blocked. Tyler Smith (Doncaster Rovers) right footed shot from a difficult angle on the right is blocked. Attempt blocked. Jack Stacey (Luton Town) right footed shot from outside the box is blocked. Substitution, Doncaster Rovers. Lirak Hasani replaces Aaron Lewis. Attempt missed. Elliot Lee (Luton Town) right footed shot from the centre of the box misses to the left. Attempt saved. Elliot Lee (Luton Town) right footed shot from the centre of the box is saved in the top left corner. Pelly-Ruddock Mpanzu (Luton Town) is shown the yellow card. Elliot Lee (Luton Town) hits the bar with a right footed shot from outside the box. Attempt missed. Jack Stacey (Luton Town) left footed shot from outside the box is too high. Substitution, Doncaster Rovers. Kieran Sadlier replaces Tommy Rowe. Attempt missed. Elliot Lee (Luton Town) right footed shot from the right side of the box misses to the left. Attempt missed. Sonny Bradley (Luton Town) header from the centre of the box is too high following a corner.